I fall into the ranks of those that were, at first, unfamiliar with Battle Chasers. Joe Madureira’s fantasy comic book series was released in April 1998, and, despite building a passionate cult following, had been criticised for the six months that readers would have to wait out between issues. 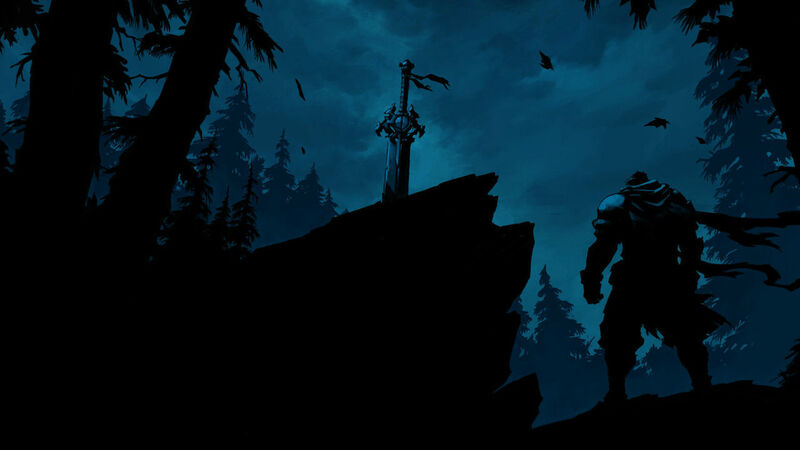 That was made all the worse thanks to the cliffhanger that it was ultimately left on years later, but, as someone that hasn’t had to suffer that understandably agonising situation, it didn’t colour my excitement for Battle Chasers: Nightwar. Perhaps, at least in gaming circles, Madureira is more recognisable for his work at Vigil Games, in letting war break out between Heaven and Hell in Darksiders and Darksiders II. With the studio shut down in the wake of THQ’s bankruptcy, he started Airship Syndicate with some old colleagues, where, after a successful Kickstarter campaign that smashed nearly all stretch goals, they have worked hard on Battle Chasers: Nightwar as their first game which has now received a welcome port on Nintendo Switch. Expansive randomly-generated dungeons ridden with traps and puzzles, turn-based combat where every decision that you make is as important as the last and a well-woven narrative that readily draws you into its world, Battle Chasers: Nightwar ticks every box for what anyone could ever want from a role-playing game. Steeped with inspiration that has been drawn from genre classics, a generous sprinkling of new ideas helps to modernise the game’s approach with the bold and eye-catching art direction helping it to stand out from the crowd. There’s a quick recap at the start for those, like me, that need to be brought up to speed, but the narrative in Battle Chasers: Nightwar largely centres on Gully and those sworn to protect her. It has been years since her father Aramus, the great warrior and leader of men, mysteriously disappeared, leaving behind the mighty gauntlets that he once wielded. Gully discovered these artifacts of untold power, said to lend their wielder the strength to move mountains, which set in motion the events that would make her become a target of great importance. We can be thankful, then, that she has the wise and mighty wizard Knolan, ancient war golem Calibretto, fallen paladin Garrison and notorious outlaw Red Monika as her defenders. These, along with Gully, collectively make up your five party characters, even if you must work to reunite them after everyone is forced to escape from their stealth ship as it is blown from the skies at the start of the game. They are a characterful bunch, at least. I enjoyed witnessing the camaraderie and banter between them, even if there is some expectation that the player will know about their adventures together travelling the Capital Lands before the events that unfold in Battle Chasers: Nightwar. It is Knolan’s personal quest to learn more about why Mana is on the decline, which fuels the world’s magic and technology, that leads the group finding themselves stranded on the Crescent Isle. You will eventually meet the devil hunter and sworn member of The Order, Alumon, who becomes your sixth party character, but that will come in time and your more pressing concern in the game’s early hours is to rally everyone together. Gully and Calibretto are the characters that you start with, who soon meet up with Garrison – Knolan and Red Monika appearing after you have conquered some early dungeons. With Harm’s Way as the central town from which your party will set out on their adventures, here you can rest at the Inn and Tavern to recover health and mana, buy more potent weapons at Grimbeard’s Smithy, craft potions at Curio Shoppe, find tougher monsters to hunt at The Altered Bestiary for greater rewards, learn crafting recipes at the Book of Secrets or trade artifacts with The Collector. This is somewhere that you will frequently return to, not least for the fact that you will be automatically taken back to the Inn and Tavern if you fall in battle – losing some money as your party makes their escape. You can even spend some time fishing as a breather on your adventures, if you want to. You are largely free to explore the sprawling Overworld map, which expectedly expands as you progress further in the story. It’s always clearly marked where you need to go in order to do so, but enemies line your path meaning that you will have to fight your way to reach your destination. You can see when these are coming up, and, while I’m sure that it may irritate some, are important to continually level up your party. This not only lends them more health and mana but will unlock new Actions, Abilities and Burst Attacks – Calibretto, for instance, needing to reach Level 23 before the last of his Abilities is unlocked. It won’t come as a surprise that you will need to call upon these to succeed in combat. With the turn order displayed on the lefthand side of the screen, you will carefully choose what to do with each character to keep the battle swung in your favour. Generally speaking, Actions are quick attacks or defensive moves whereas Abilities will consume mana. Certain Actions can generate Overcharge, which will be consumed first to help you conserve your mana and can help strengthen your attacks with specific Abilities. It’s all easy enough to grasp, and, as you familiarise yourself with the descriptions for each character’s Action and Abilities, it won’t be long before you work up a rhythm to deal with these enemy encounters. Your party’s Burst Bar will build whenever you attack, heal or take damage, eventually reaching different levels that will you can choose to use powerful moves that each character has. That could be Gully’s Shielded Assault that casts a protective Damage Shield over the whole party or Garrison’s Relentless Assault that will increase everyone’s critical hit rate. These are all performed with animations that, while completely over the top, are hard not to appreciate in how satisfying the delivery is. While each character has multiple roles to play in combat, given the breadth of Actions and Abilities your party is somewhat commendably interchangeable. You can only have three party members at any point in time, so you will want to spend some brief time working out which combination works best for you. I came to rely on Calibretto for healing and more widespread damage, Gully to reduce incoming damage and to smack enemy jaws with her colossal gauntlets, with Garrison mercilessly inflicting bleed. Every character has access to some form of buff or debuff, so there’s more than enough room for some experimentation. Kill the same enemy type multiple times and you will unlock more Combat Knowledge about them in the Bestiary, meaning that you will be able to see their health and the abilities they use in battle. It’s a nice touch that pushes you into combat rather than avoiding it, but, sadly, there is one misstep that the developer has made. Characters that aren’t in your active party don’t receive experience, and, therefore, soon sees them falling behind the rest. That’s less of a problem for those that quickly find three characters that they are happy to stick with for the game’s entirety, but, down the line, will lead to instances where your choices for tougher dungeons are limited unless you regularly swap characters to even their levels. The dungeons that you will have the chance to explore are randomly generated, with the player encouraged to replay them thanks to multiple difficulty levels to overcome to score rarer loot. Getting better weapons, armour and trinkets will help to strengthen your party, and the developer lets you know how challenging the dungeon will be on each difficulty before you make your choice and step inside. Navigated from an isometric angle, you will continue to face enemies and solve puzzles as you move from room to room. But, dungeons are also where more life has been breathed into the world, with leftover notes and books letting you read more about what has transpired. Every character has their own Dungeon Skill to use, whether that be helping to heal your party between battles, increasing your movement speed to dodge a wayward trap or Gully slamming the ground to stun enemies before you clobber them. Take a moment to step back and appreciate Battle Chasers: Nightwar as a whole, and, looking beyond the game’s clear inspirations, it strikes out with enough of its own identity to deliver a stirring and memorable adventure. There’s still some room for improvement, especially in the unavoidable grind as you reach your quest’s later stages, but it is a promising start for Airship Syndicate that has made me excited to see what comes next.